Prescription Patterns of Traditional Chinese Medicine for Peptic Ulcer Disease in Taiwan: A NationwidePopulation-based Study. Huang CY1, Lai WY2, Sun MF3, Lin CC4, Chen BC5, Lin HJ6, Chang CM7, Yang CH6, Huang KC8, Yen HR9. Peptic ulcer disease is a common digestive disease. There is a lack of large-scale survey on the use of traditional Chinese medicine (TCM) for the treatment of peptic ulcer disease. 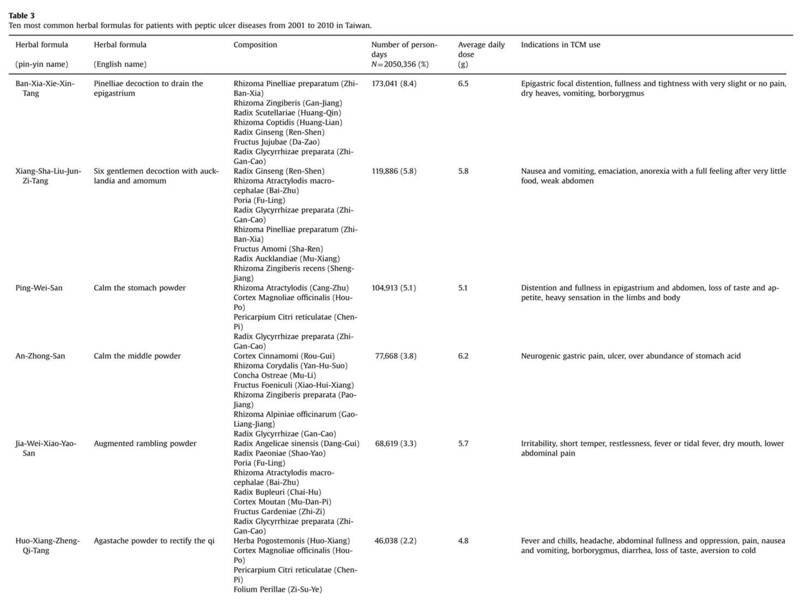 This study aimed to investigate the utilization of TCM for the treatment of peptic ulcer disease in Taiwan. 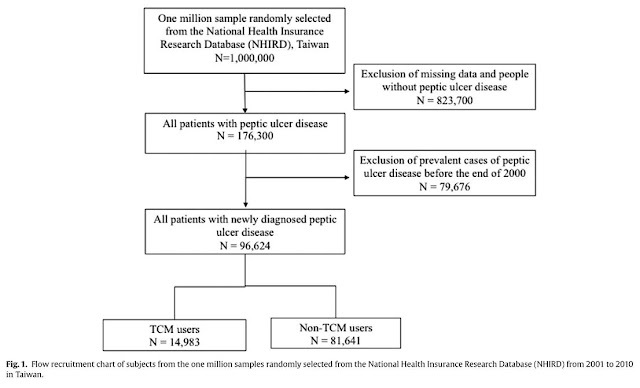 We analyzed a random sample comprised of one million individuals with newly diagnosed peptic ulcer diseasebetween 2001 to 2010 from the National Health Insurance Research Database in Taiwan. 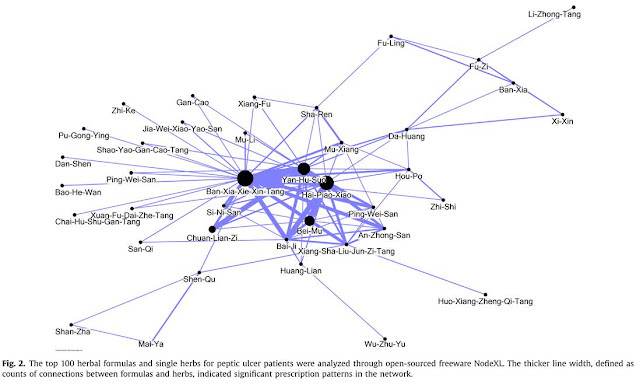 Demographic characteristics and TCM usage, includingChinese herbal formulas and the single herbs prescribed for patients with peptic ulcer disease, were analyzed. A total of 96,624 newly diagnosed subjects with peptic ulcer disease were included. 14,983 (15.5%) patients were TCM users. 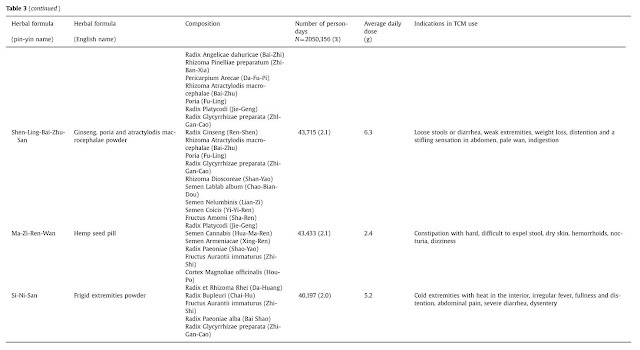 People residing in highly urbanized areas, younger people and female (compared with male) were more likely to use TCM. With regard to the comorbidities, TCM users had a lower prevalence of coronary artery disease, chronic obstructive lung disease, diabetes mellitus and liver cirrhosis and stroke. The average time between onset of peptic ulcer disease and the first visit to a TCM clinic was 4.7 months. Majority of the patients (n=14,449; 96.4%) received only Chinese herbal remedies. The most frequently prescribed Chinese herbal formula and single herb was Ban-Xia-Xie-Xin-Tang (Pinelliae Decoction to Drain the Epigastrium) and Hai-Piao-Xiao (Os Sepiae), respectivley. The core pattern analysis showed that combination of Ban-Xia-Xie-Xin-Tang, Hai-Piao-Xiao (Os Sepiae), Yan-Hu-Suo (Rhizoma Corydalis), Bei-Mu (Bulbus Fritillariae Thunbergii) and Chuan-Lian-Zi (Fructus Toosendan) was most frequently used for peptic ulcer disease. 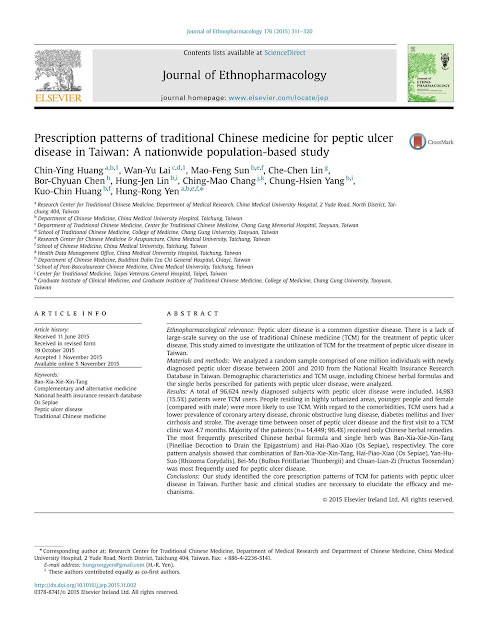 Our study identified the core prescription patterns of TCM for patients with peptic ulcer disease in Taiwan. 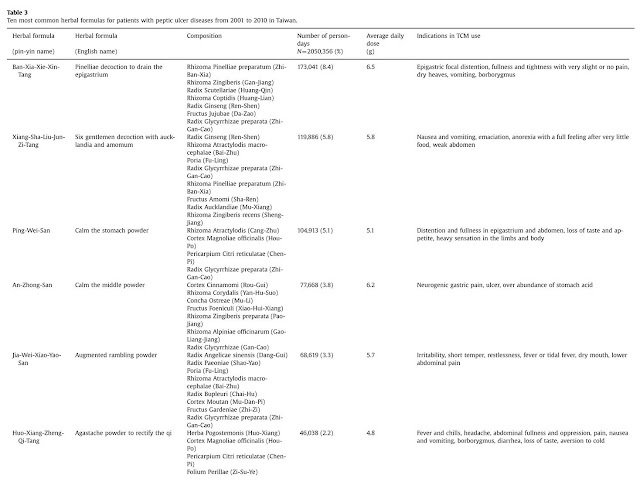 Further basic and clinical studies are necessary to elucidate the efficacy and mechanisms.